Welcome! This website documents wildlife and wild plants found in the hills on the border between Oakland and Berkeley, California. The area covered is roughly bounded by Tunnel Road, Domingo Avenue, Claremont Canyon Regional Preserve, and Grizzly Peak Blvd., with emphasis on Claremont Canyon and the surrounding hillsides See map. The website is a work in progress, and probably always will be. We began in 2005 with lists, followed in 2007 with pictures of birds, insects, mammals, and reptiles; later we added a photo gallery documenting wild plants found in the same area. Still later we opened a gallery to show fungi, lichens, and other organisms that don't quite fit elsewhere. And now there is also a gallery for rocks and minerals. All the galleries are updated as new pictures become available. Birds, Butterflies, Mammals, Reptiles, Amphibians, Plants, Mushrooms, Lichens. Once inside the index, open a search box (CTRL+F) and type in your search term. The pictures in these galleries represent the volunteer efforts of many photographers: friends, neighbors, and others who care about the natural environment of Claremont Canyon. Photographic contributions are welcome - see the guidelines. The website itself is the result of encouragement from members of the Claremont Canyon Conservancy, the North Hills Phoenix Association (now, North Hills Community Association), and the East Bay Chapter of the California Native Plant Society. At every step of the development process, my husband, Bill Loughman, provided technical and aesthetic advice, moral support, and more. I am grateful to all. 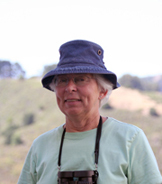 A birder, native plant enthusiast, and long-time resident of Gravatt Drive, the compiler is still learning about natural history, photography, computers, and web pages. Questions? Contact me. Wildlife species reported in 2018: Detailed list.